At the start of the game, the four spinners should be in this position: facing inwards, towards the red pegs. If you made it this far, congratulations; you now have a game that should provide years of enjoyment and challenge! Let’s cover the rules before we lace up those skates and shave some ice. 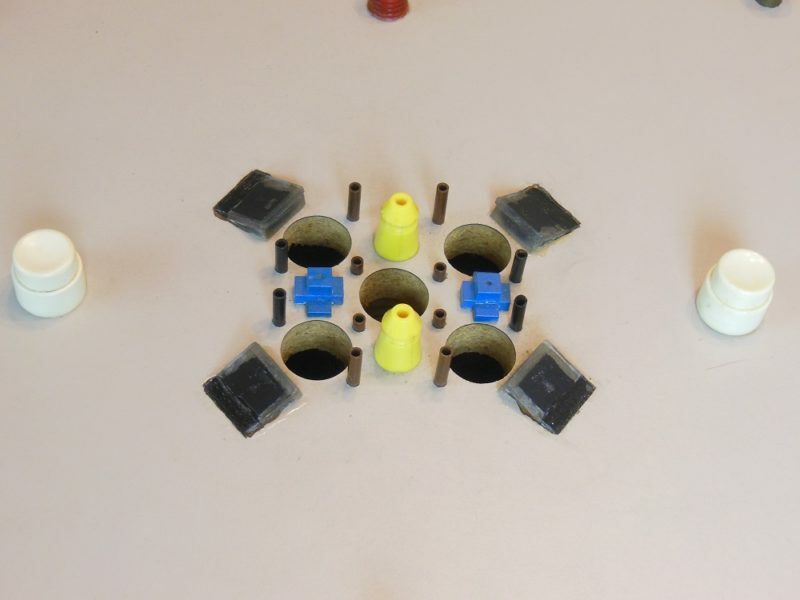 One player is positioned on each end of the game board. You score by getting the puck (a U.S. Quarter) into your goal (the hole at the far end of the board). If you accidentally score in the opponent’s goal (the hole nearest yourself), they get a point. The first to reach 10 wins. But you must win by 2 points, so the game continues until that condition is met. By overhanging the quarter a bit, you can launch it with an upward arc. A quick shootout determines which player starts the game. 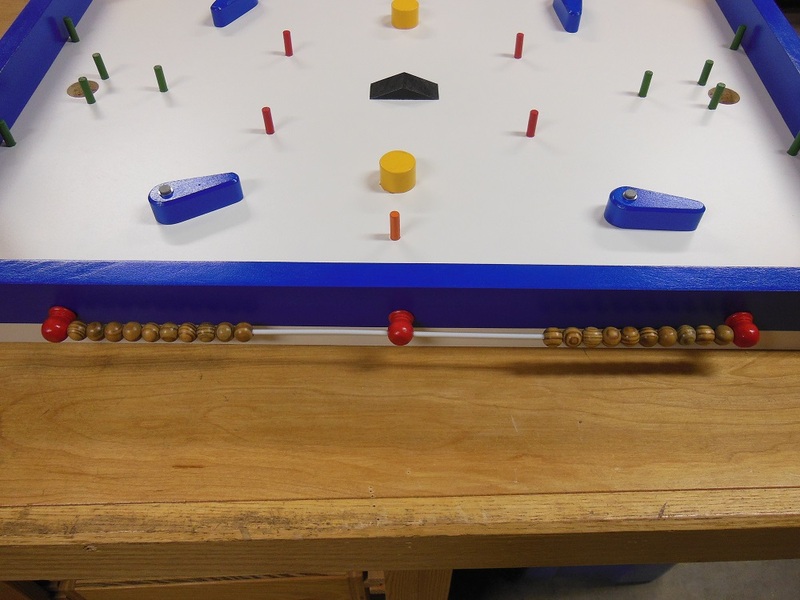 Each player places a quarter on one of the two yellow serving posts and tries to launch it as close to their own goal as they can. Whoever is closest starts the game. Remove the losing quarter from the board. Depending on house rules, the starter can either relaunch (serve) to start the game or take their second shot from where their quarter landed. A “play” begins with the player who’s turn it is to serve launching the quarter from atop either of the yellow serving posts. It’s possible to score on the serve, so it pays to practice your launching technique. 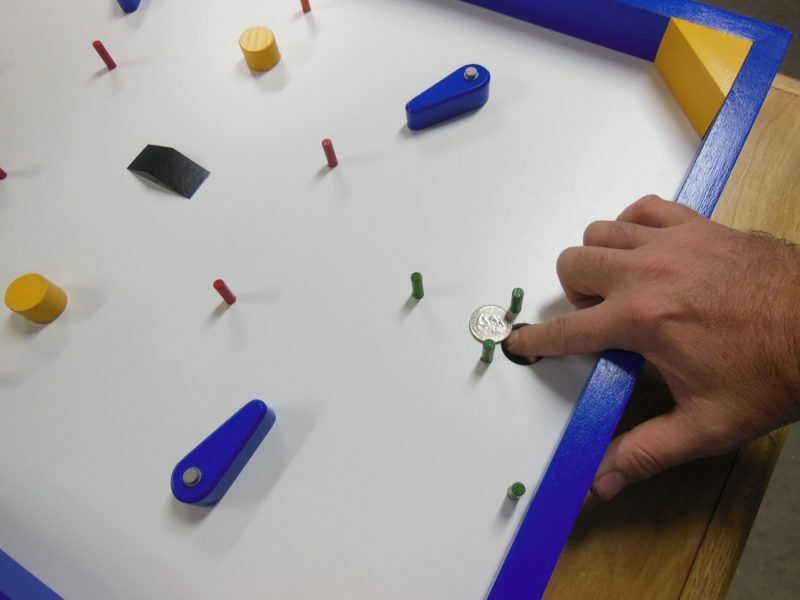 If at any time the quarter is shot off of the board, the player’s turn ends and their opponent serves to start a new play. If the server does not score with their launch shot, they take their second shot from wherever the quarter landed. Players then take turns (two shots per turn) shooting the quarter from whenever it lies until someone scores a goal, at which time they receive a point and it’s the other player’s turn to serve. You’re allowed to hit a spinner directly: either to shoot the quarter, as a defensive move to block the opponent’s shot or to clear a path for your own shot. You may shoot in any direction. When shooting from the along the side rails, the corner blocks can get you near the goal (or even allow you to score, if you get lucky). The ramp and serve launches can each be used to score in a single shot, but it takes a little practice. Sometimes it’s best to dedicate your first shot to setting up for a goal shot, rather than trying to score with every hit. When the quarter lands hanging over your opponent’s goal, like this, you can launch it in an arc across the board and bypass a lot of the obstacles. Sometimes you may even score this way. If you don’t have a good shot, perhaps consider a defensive move by setting your opponent up for a more difficult shot. Or flick a spinner to impede their path. 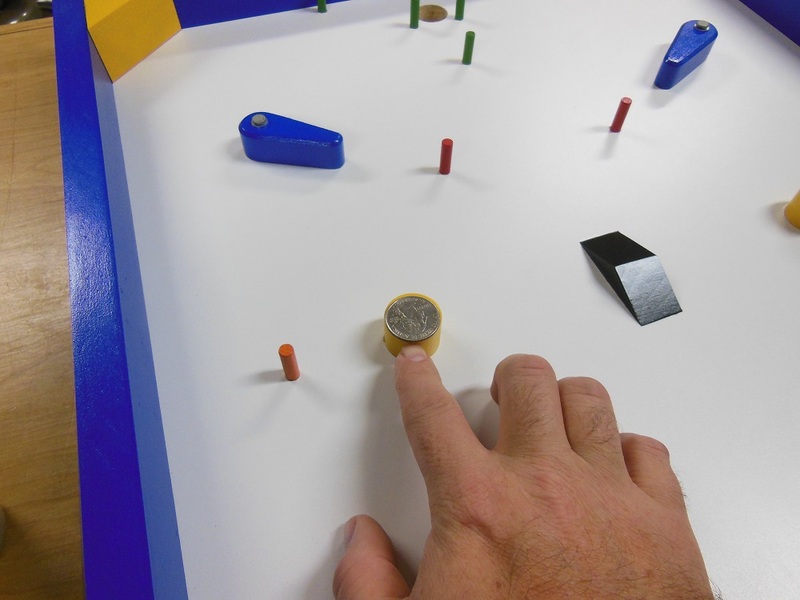 Have fun exploring and learning the many possible shots on this quarter hockey game board. There are tons of them that aren’t so obvious at first. 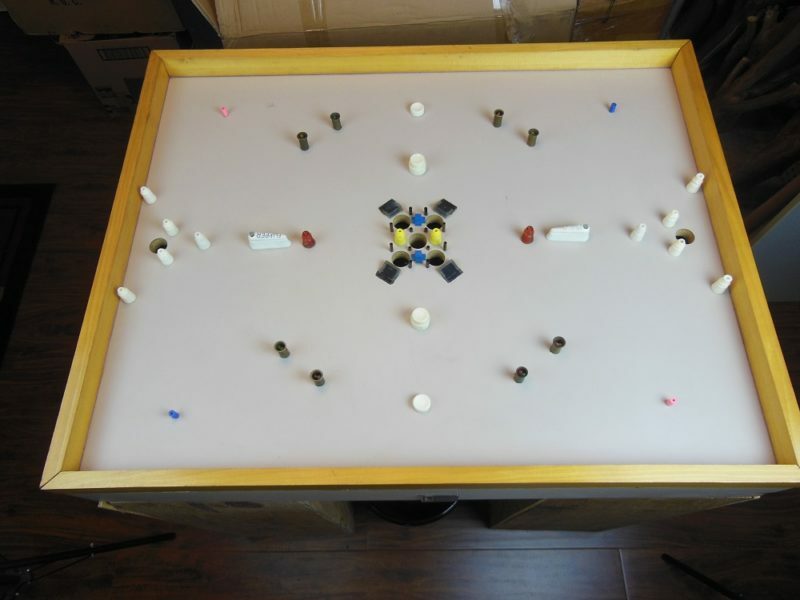 This 8” x 16” board is where it all began; my introduction to quarter hockey. I made this in late 1989. 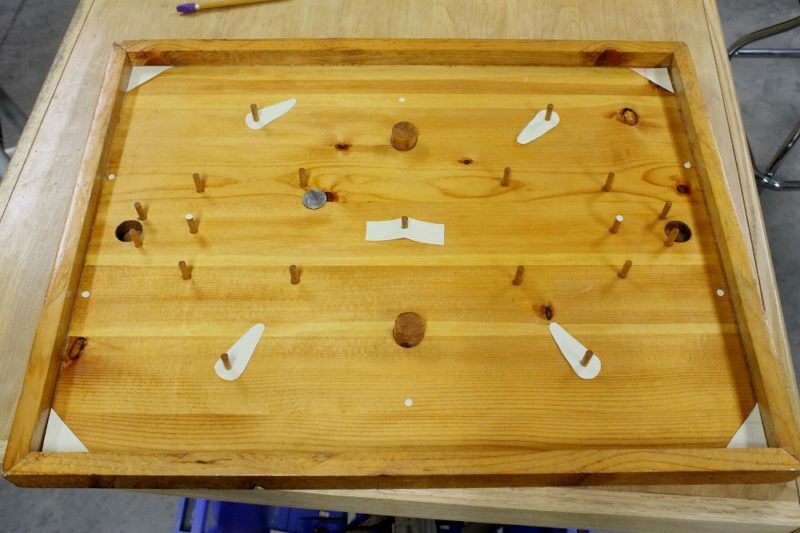 I built my first quarter hockey game board – a very simple project from an old (even at the time) book – in high school shop class. Unfortunately, very few high schools have shop anymore. The first quarter hockey game board of my own design. 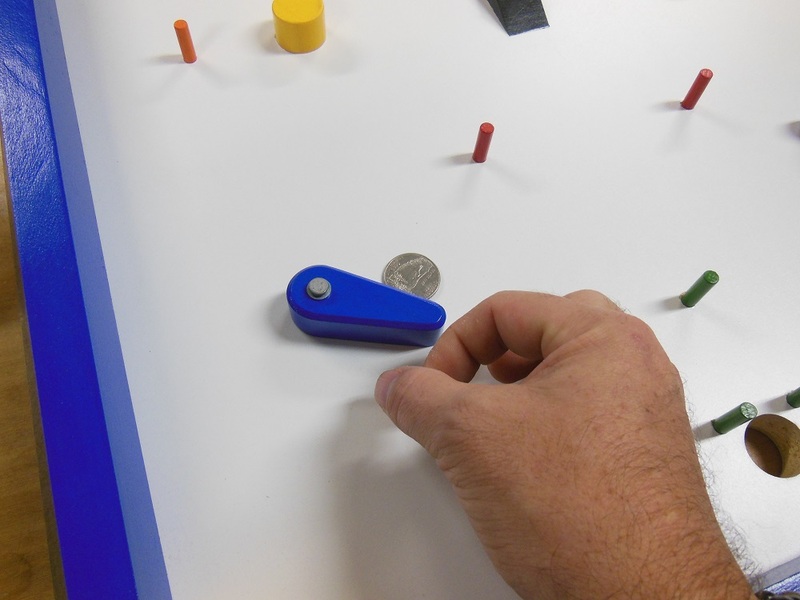 This one measures 19-1/2” x 25-1/2” and is vastly more fun to play than the original. I built this in 1989-1990. I loved the idea but felt it was way too simple. I immediately designed and built a more complex version that was a lot more fun to play and with much greater replay value. Since then, I’ve created two additional iterations (including the one featured in this article) that were even bigger and better. 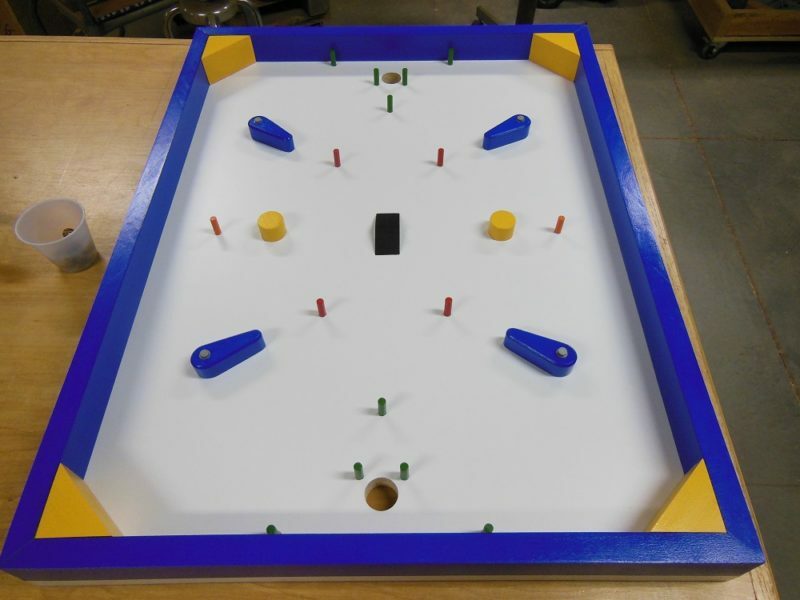 The “mack daddy” of quarter hockey game boards, measuring in at 27” x 34”. I created this one in 1993, I believe. 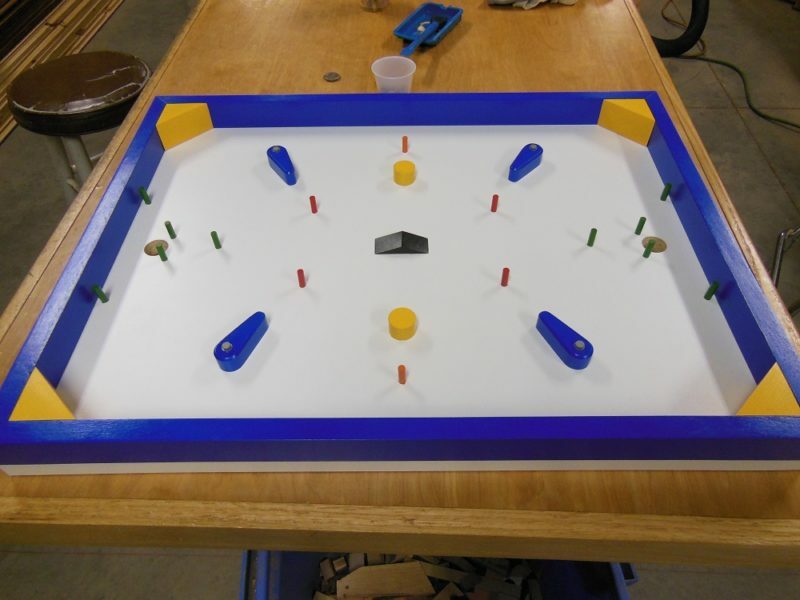 A couple years after high school, I introduced my new grown-up friends to quarter hockey and it took on a life of its own. The larger board was such a hit that I was compelled to outdo myself. So I designed and built a third generation. The new version was made on a Formica-covered MDF base. 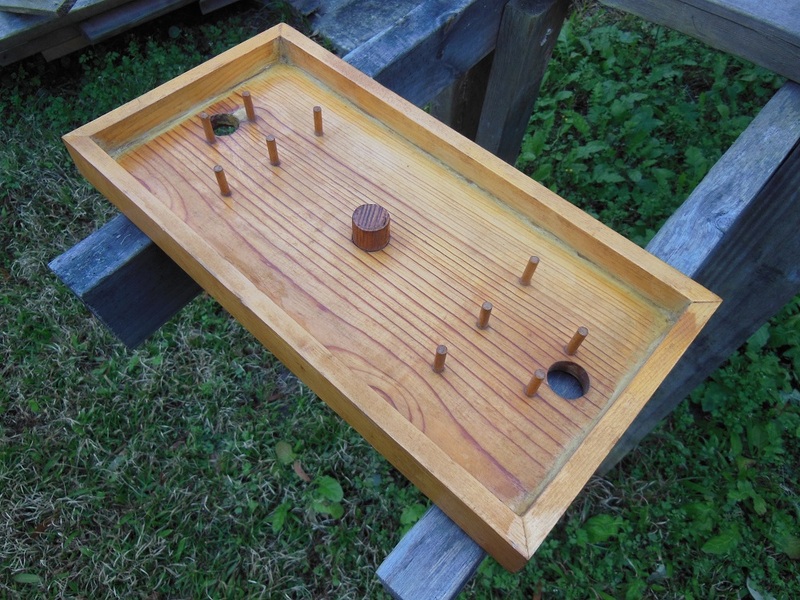 Because of the 3-point holes, this one is played to 20 points (win by 2 rule applies). It was bigger and better in every way, with superior quarter glide and ricochet action and all new features, and immediately became hugely popular with my circle of friends. It was a legitimate source of fun; sometimes even a drinking game. Parties were scheduled around it; it was a center of attention – off and on – for years. The end goals return the quarter to these small fish nets on either end. Most of the playfield components (including the brass and phenolic tubes) were harvested from old pinball machines. The blue cubic pyramids in the middle are constructed from service tech buttons that were used on the inside of old Protel pay telephones. 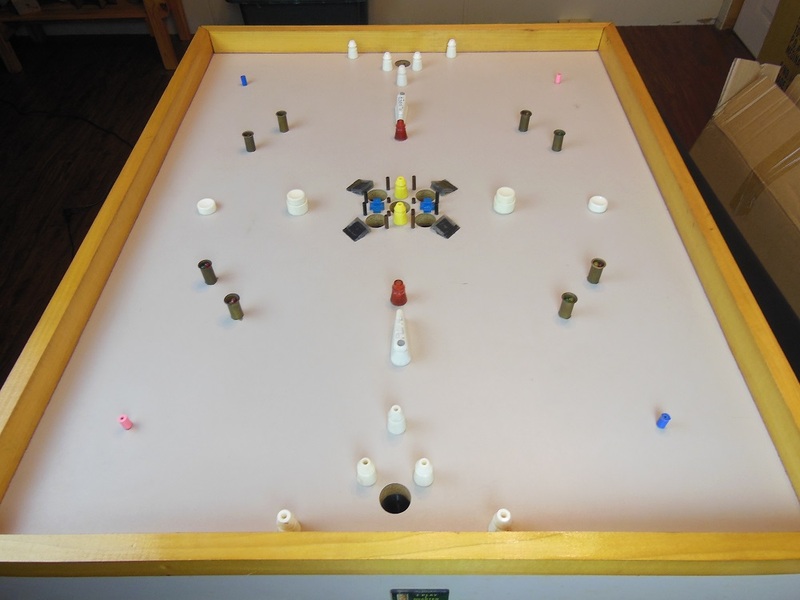 The two pinball flippers act as moving spinner obstacles, like those on the project featured in this article. The four ramps – which come into play in surprising ways – are constructed from clear acrylic painted black on the underside. There are even 18 LEDs in this board, complete with handmade driver circuits. The two farthest center holes give you 3 points. The closest give 3 to your opponent. The center hole is a trap. The stakes are high. Do you have the guts? The big board has 6 scoring holes and one trap hole. 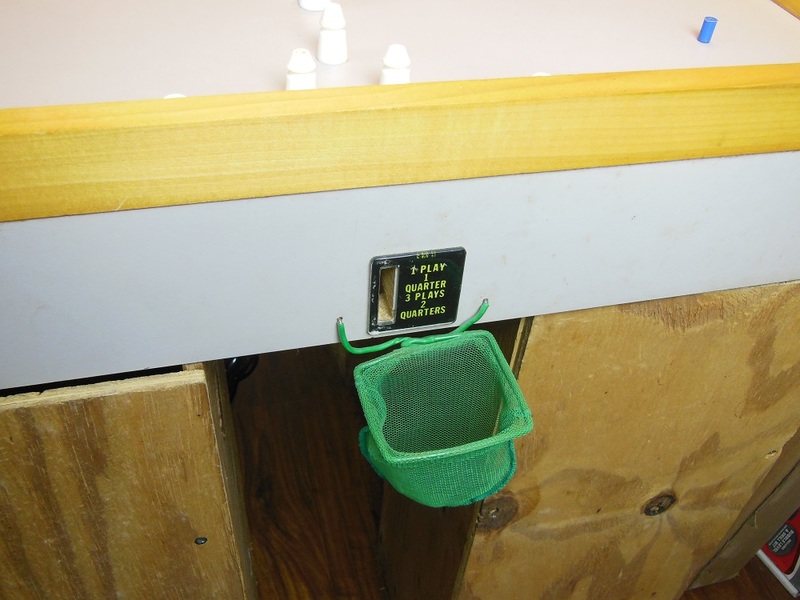 All holes feature coin return chutes, save for the trap, which “eats your quarter”, sending it to the beer fund. The four 3-point holes have old telephone bells that the coin rings as it drops through. Ah… the sights! The sounds! The free beers! And this board is still played to this very day. 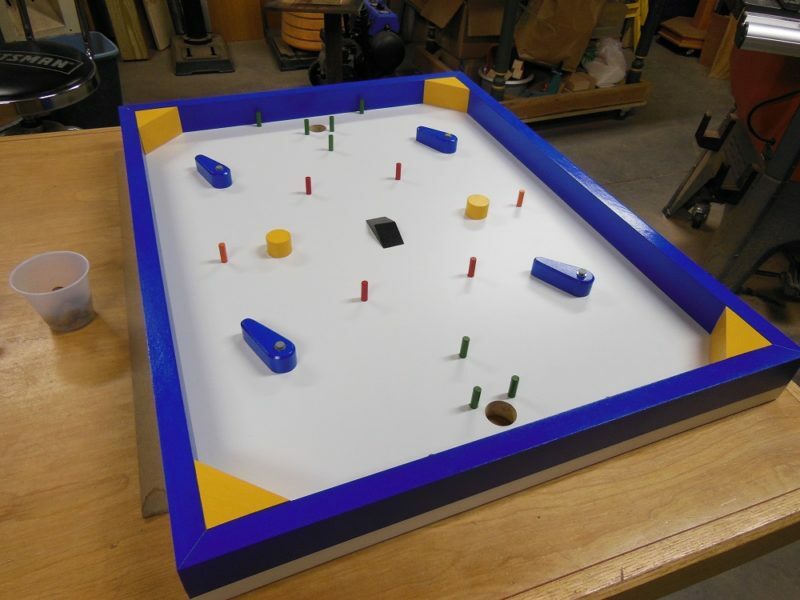 Planning the Rockler-sponsored quarter hockey game board. 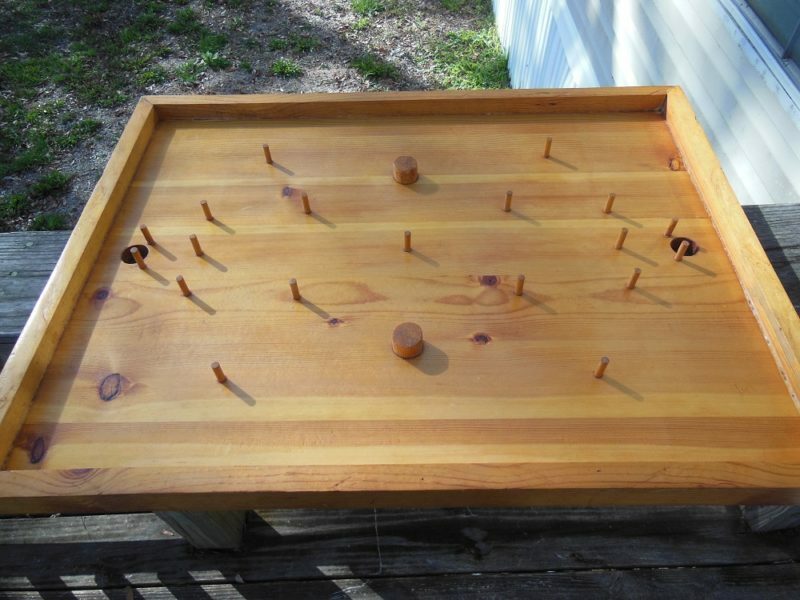 When HomeFixated.com’s sponsor, Rockler Woodworking & Hardware, inspired me to create a new quarter hockey game board I agonized for months. How can I improve upon what I’ve already made? Should I go bigger? Should I drastically alter the layout? Believe it or not, it wasn’t an easy decision. Every change I made to the “big board” was actually a change for the worse. As it turns out, it’s a pretty solid game as is. So I toyed around with combining elements from the second and third boards. I prefer the improved goalie layout – and love the dynamic spinner aspect – of the big board. During gameplay, every spinner ends up coming into play multiple times. But the big board requires a lot of real estate, which might not be feasible in many homes. The size of the second board is great, but it doesn’t allow for the extra holes in the middle. So I went with the dimensions of the third board and the goalie layout of the big board. I used materials everyone has access to, changed the peg setup, went with four spinners, added corner blocks, a single central ramp and voilà: another board I really enjoy playing on! Finally, an on-board score keeper! A teenager and I have been playing this new board for several weeks now and love it. The layout works great and it’s different enough to be a whole new, fresh experience from the other boards in the lineup. With our 27 year age difference, if we can bond, trash talk and enjoy ourselves over quarter hockey there’s no reason your friends and family can’t do the same. Keep your stick on the ice and we’ll see you at the playoffs! Thank you for the feedback, Marla!